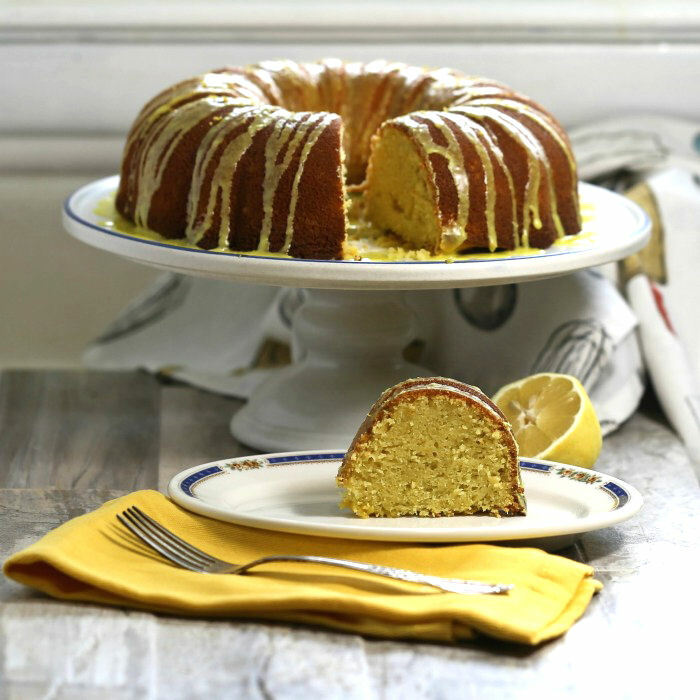 This lemon pudding bundt cake recipe is made from scratch and has a light, bright taste. The pudding gives the taste an extra richness and the light lemon glaze is sweet but not overly so. 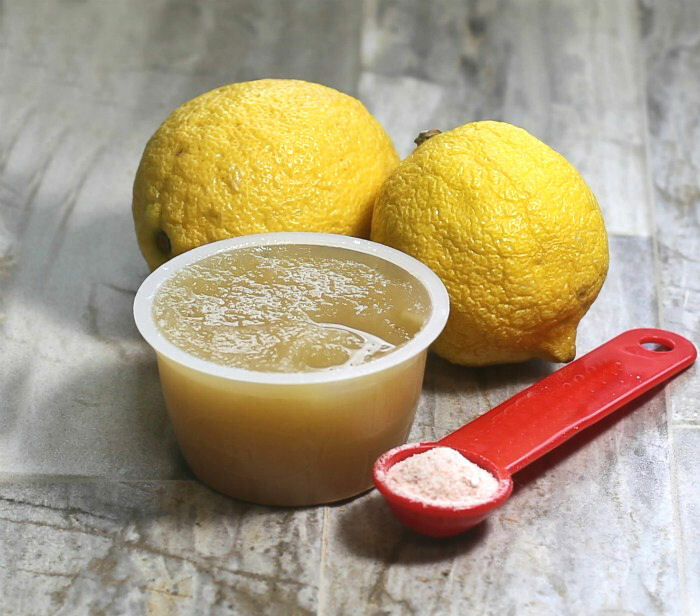 Summer is the time when I love to make desserts with lemonade or lemons. They are so plentiful and fresh and add a brightness to a dessert that reminds me of lazy days and warm weather. If you asked my husband what his all time favorite flavor of desserts is, he’d say “those lemon bundt cakes you make” without a second’s hesitation. He is not fond of overly sweet desserts and prefers those that are lightly sweet to satisfy his sweet tooth without going overboard on sugar. This dessert is the perfect addition to a summer dessert table for your next outdoor party. 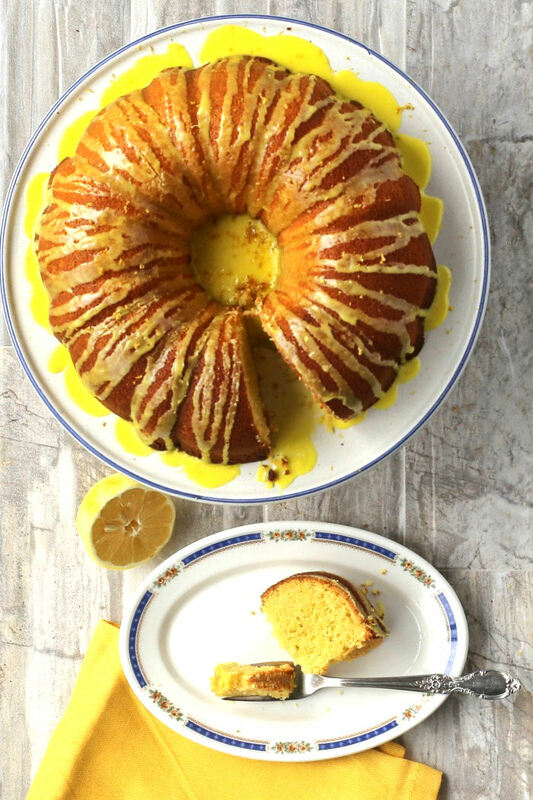 The bright flavor of this recipe for lemon bundt cake comes from fresh lemons, but unsweetened applesauce means that I can do away with the oil and sea salt gives a coarse salty flavor to the batter that compliments the rest of the ingredients well. Since my husband and I are both trying to lose some weight, I decided to lighten his favorite cake up a little. When you are using butter, sugar and flour in a dessert there aren’t many things you can do to limit the calories, but I have done my best. I like to lessen the calories on any desserts that I make by making substitutions in the ingredients that won’t affect the taste. Using fat free sugar free pudding mix adds a richness to the cake and makes it extra moist. Nonfat milk gets rid of a few more calories, and applesauce saves a TON of them in place of oil. The final step to making this cake light is to use a glaze instead of a butter cream frosting. It still gives loads of flavor without all the calories and fat that buttercream frostings add. It is amazing what a difference these substitutes as well as portion control does for saving calories. This cake works out to just 248 calories, which is not at all bad for a dessert. Start by mixing your dry ingredients in a medium bowl. Be sure to measure the flour correctly to make sure the cake ends up being light and not dense. Another small bowl will be used to combine the milk, applesauce and vanilla extract. Set these bowls aside. I used a stand mixer with a paddle attachment and creamed the butter and sugar until it was light and fluffy. This took about 3 minutes. The lemon pudding mix goes in next. It will make the batter very rich and moist and will give the cake a light yellow color, as well. Now it’s to add the eggs. I beat them in, one at a time, and made sure to incorporate each one well. 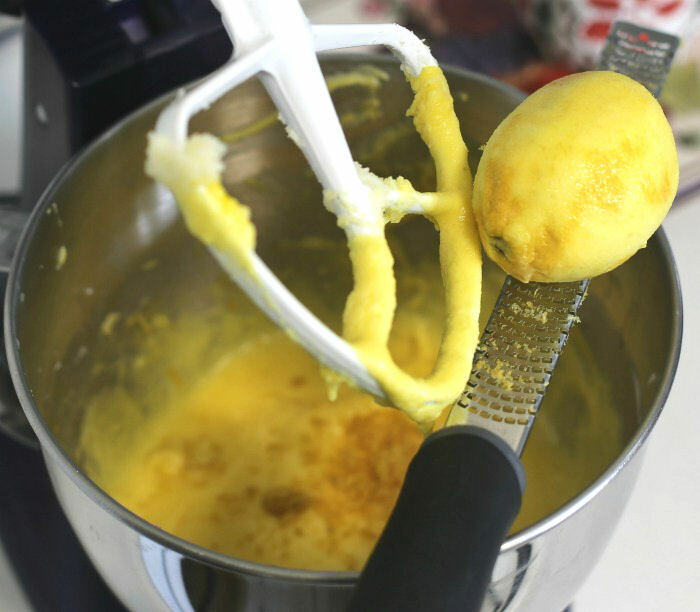 Finish with the lemon zest for a nice, bright fresh taste. More yellow color! 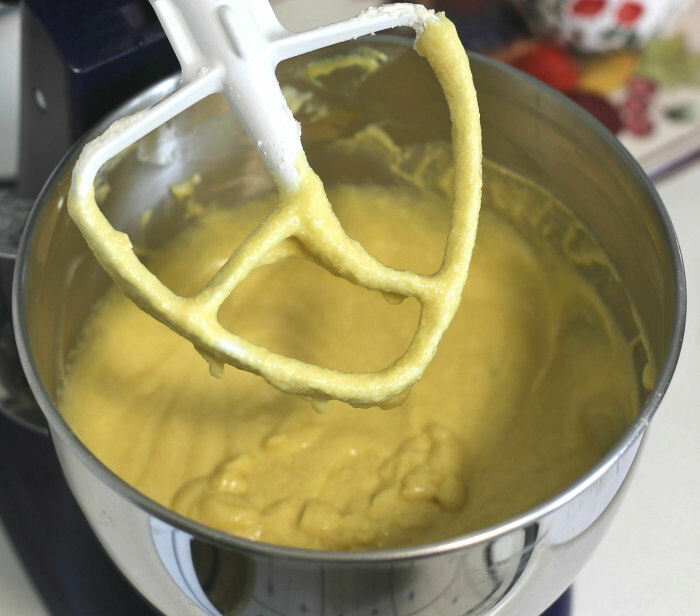 To make the cake batter, alternate between the dry ingredients and then the milk mixture, about a third at a time until all of the ingredients have been combined well. Beat on medium speed for 2 minutes after the last addition. 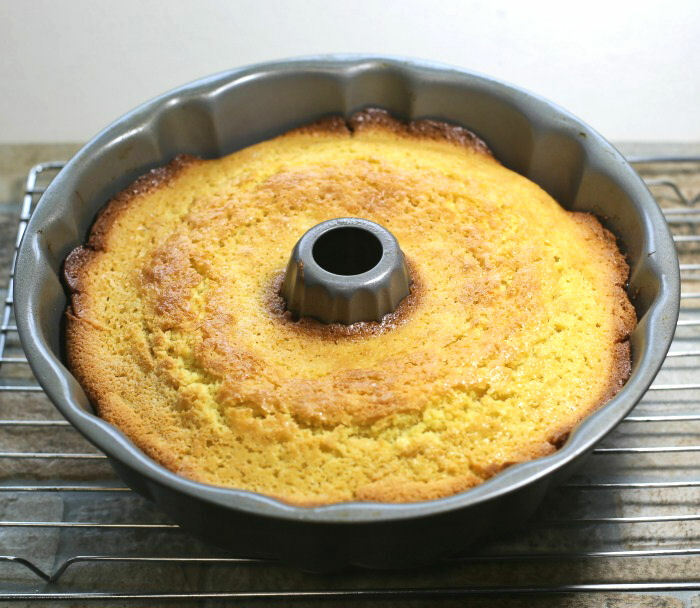 Pour the batter into the prepared Bundt pan and bake for 55 to 60 minutes, or until a toothpick inserted into the center of the cake comes out clean. Once the cake has been baked, invert the cake onto a baking rack to cool while you make the icing. My original lemon bundt cake had a buttercream frosting. In order to keep the calories, down, I decided to do a glaze for this cake. It takes just minutes to make. 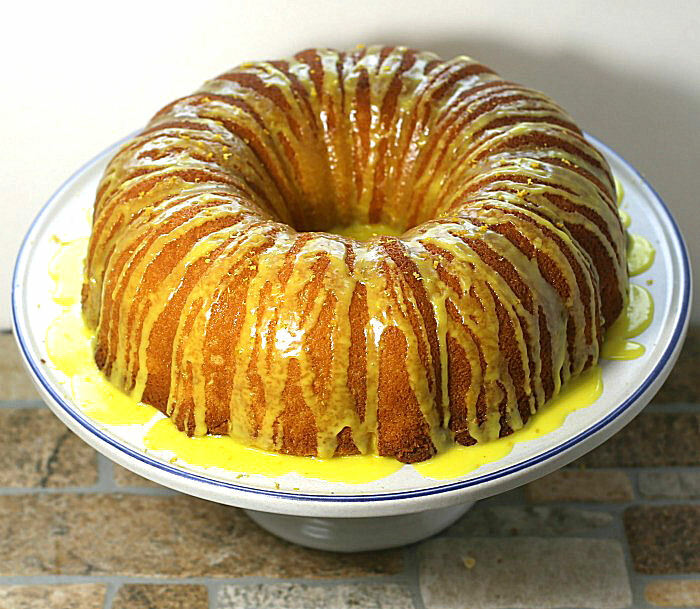 To make the lemon glaze icing, combine the powdered sugar, lemon juice, skim milk and yellow gel food coloring. Stir until the mixture is smooth. The glaze will not be too thick, since you want it to flow over the edges of the cooled cake. 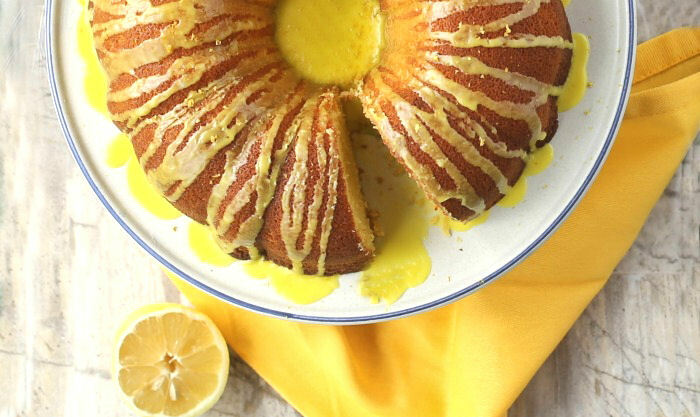 Drizzle the lemon icing over the cake and finish off by sprinkling with fresh lemon zest. Tip: Place the icing glaze in an icing bag and drizzle it over the top of the cake. It makes it much easier to get thin stripes of icing glaze where you want them. This glazed bundt cake is fluffy and moist with an amazing lemon flavor that is so bright and summery. 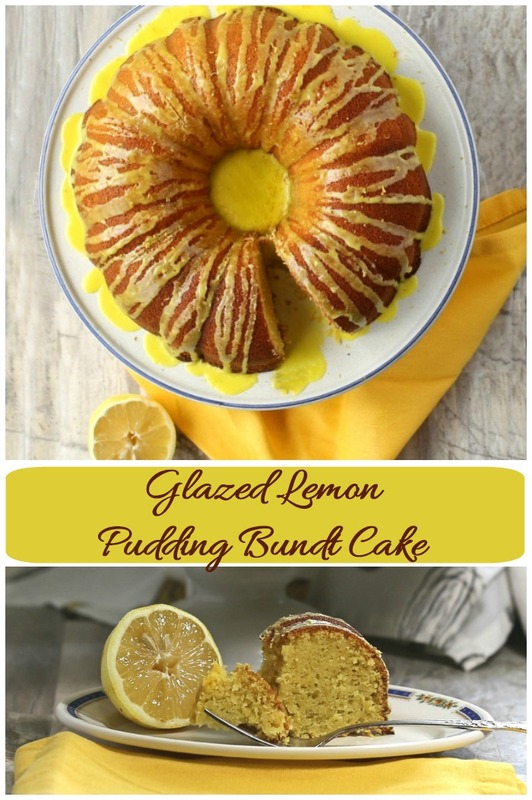 The pudding make the cake extra rich and the lemon glaze is light but still gives the cake a sweet finish. At only 248 calories for each slice, you won’t break your calorie bank for the day. The kids will love this cake with a glass of skim milk in the afternoon and you’ll love serving them something sweet that is not too filled with sugar and oil. This cake is perfect all summer long and would make a super Easter dessert, too! Are you trying to lose a few pounds? Here are some of the things that I do to lighten up my cake recipes. All of them save a few calories, but combined together, they can make a big difference in the total calorie count. Use applesauce instead of oil. One cup of canola oil has 1927 calories, but one cup of unsweetened applesauce is only 102. That is a huge difference even when you are only using a third of a cup as in this recipe. 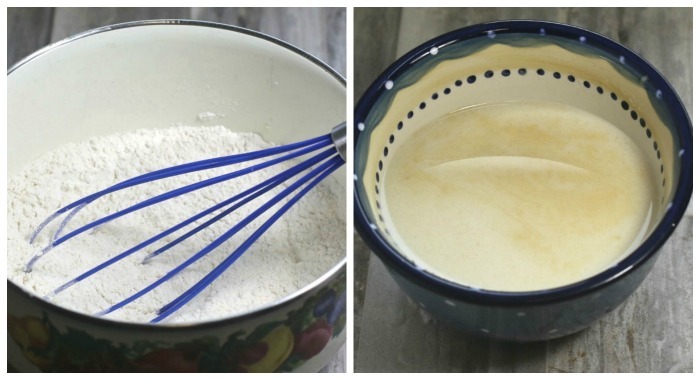 Use skim milk instead of whole milk in the frosting. It weighs in at 83 calories instead of 150. Make a glaze instead of an icing. You’ll use far less sugar and no butter so it keeps both the sugar and fat content down. Portion control is a must. I find that sometimes all I need is just a taste of sweetness at the end of a meal. 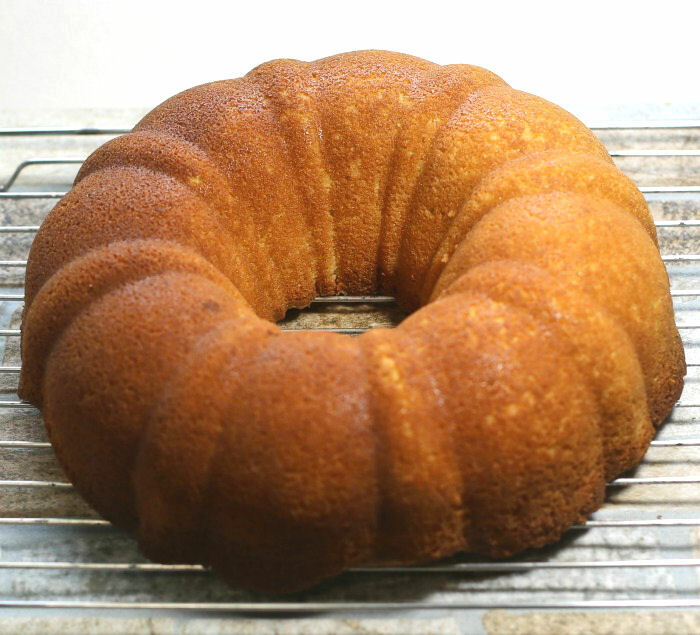 A bundt cake this size, cut into 16 pieces instead of 12 will save 83 calories a slice! Fat Free Sugar free pudding mixes added to a cake recipe adds extra moisture and only 100 calories. You won’t miss the oil at all if you combine pudding and applesauce instead of the oil. Cut out some of the sugar. My original cake called for 1 1/2 cups of sugar. I change it to 1 1/4 cups for this recipe, saved 190 on the cake calories and didn’t miss the bit of sugar at all. 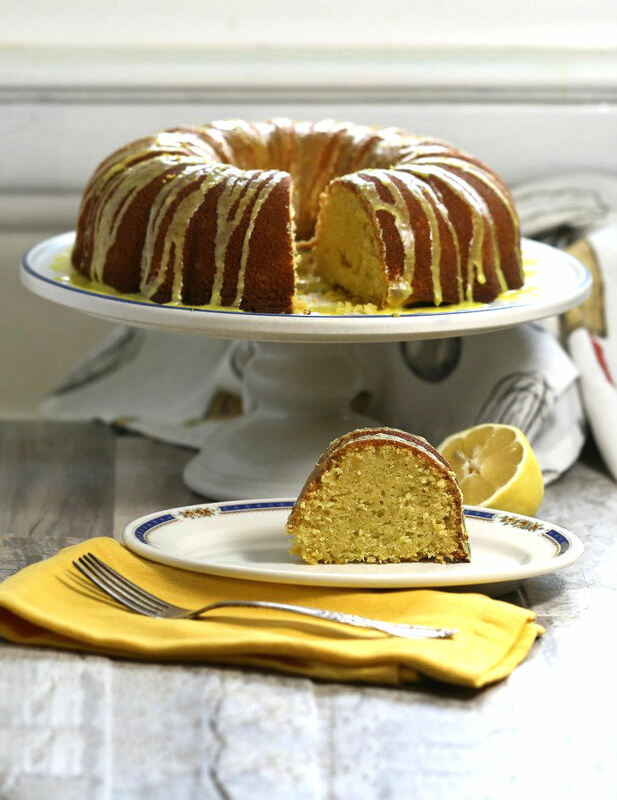 If you would like a reminder of this lemon pudding bundt cake recipe, just pin this image to one of your Pinterest dessert boards, so that you can find it easily later. This lemon pudding cake has a bright, fresh taste. It is sweet and easy to prepare. 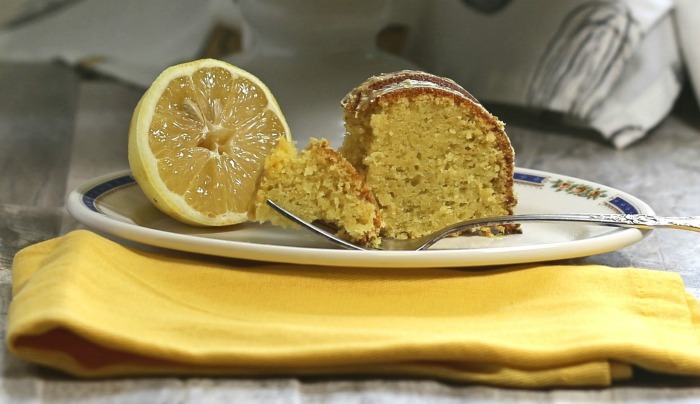 The light lemon glaze gives a nice finish that is not overly sweet. Preheat the oven to 325 º F. In a medium bowl, whisk together the flour, cornstarch, baking powder and sea salt and set aside. In a small bowl, combine the milk, applesauce and vanilla extract. Set this bowl aside too. 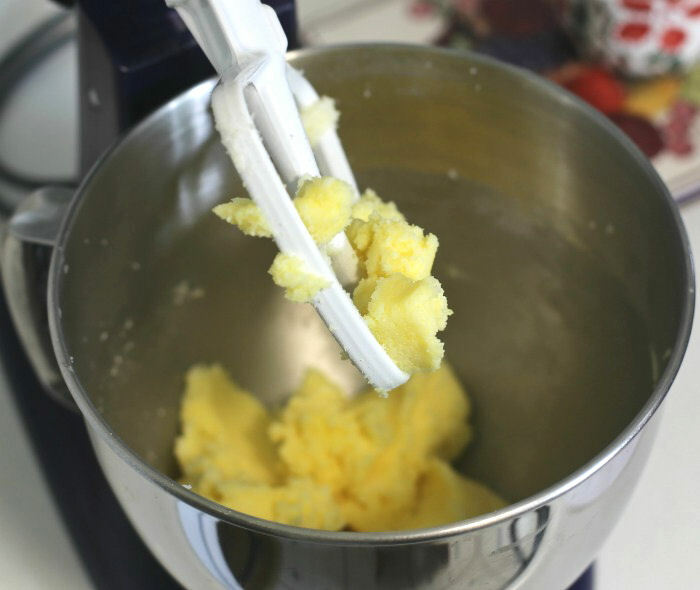 In the bowl of a stand mixer, with a paddle attachment, cream the butter and sugar with a paddle attachment until light and fluffy. about 3 minutes. Mix in the lemon pudding mix and combine thoroughly. Beat in the eggs, one at a time, making sure to incorporate each well. 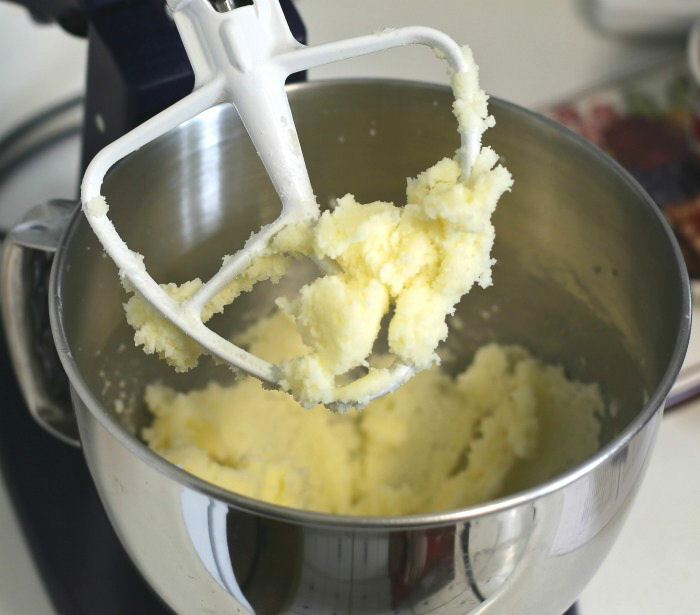 Add a third of the wet and then a third of the dry ingredients into the bowl of the mixer, incorporating well after each addition. Repeat until all the wet and dry ingredients have been mixed in. Mix on medium speed for 2 minutes after the last addition. 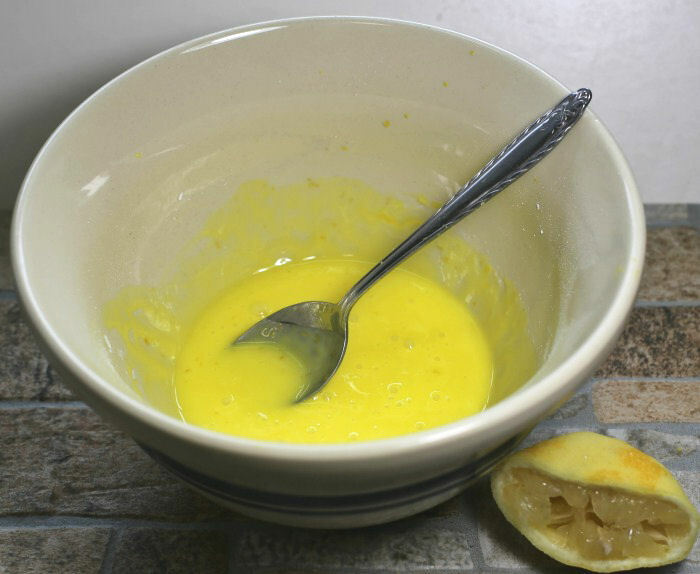 To make the icing glaze, combine the powdered sugar, lemon juice, lemon zest, skim milk and food coloring in a bowl. Stir with a spoon until the mixture is smooth and place in an icing bag. Drizzle the lemon icing over the cooled cake and sprinkle with lemon zest.